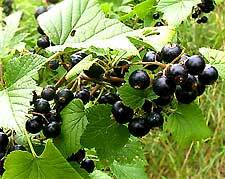 When the summer comes along, anyone with fruit bushes will soon find that they have a real glut of blackcurrants on their hands. By using some of these berries to create a rich jam, you can be sure to enjoy their flavour long after the summer sunshine has disappeared for the year. Add the blackcurrants and pint of tap water to a large saucepan and bring to the boil. Simmer this mixture for no more than ten minutes, stirring occasionally. When you are happy that the berries have been softened, remove the pan from the heat. Mix in the sugar and one teaspoon of lemon juice (optional). Return the saucepan to the hob and cook the mixture on a low heat, until the sugar has completely dissolved and all of the crystals have gone. 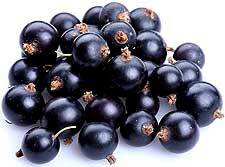 You can now increase the heat so that the blackcurrants return to the boil for a few minutes. Stir to prevent the mixture 'catching' and burning on the bottom of the pan, and then simmer for a further 15 to 20 minutes. Once the syrup has started to noticeably thicken, it is likely that your blackcurrant jam has reached its setting point. Test this by placing a small spoonful onto a chilled plate (previously placed in the freezer). If the jam starts to set and holds its shape when you touch it after a minute, you can be confident that your mixture is ready to be spooned or poured into your glass jars (sterilised in advance). If you feel that your jam would benefit from a few more minutes' worth of boiling, place the pan back onto the heat and repeat this setting test as many times as required. 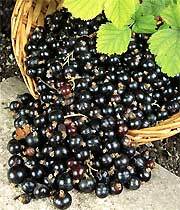 Blackcurrant Jam Recipe - More Jam Recipes.